Photo taken of scene in Algeria. On the evening of the 21st of May in 2003, Algeria was stuck by its worst earthquake in 23 years. More than 2,000 people were killed and more than 9,000 injured. 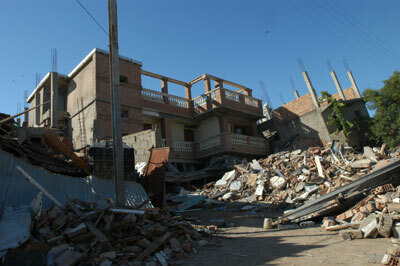 Many homes were destroyed in the initial quake and thousands more were damaged and made uninhabitable. --->>> Our Thursday (Christmas) evening in NZ (we are a day ahead) we were informed directly by Source within one of the most powerful channelings of my life, that a significant earth event was in process. Then a couple mornings later we were informed (our Saturday morning) there was a quake in Iran. There have been a series of quakes - even one here on the North Island of NZ recently. There was the one in California just a few days ago, and now this one in Iran causing significant damage. The earth is now moving into more of a profound process of release and these activities as we have been told, will be continuing throughout the world on a consistent basis now!! Please listen to your guidance daily so that you are attuned to where you need to be during these intense times of profound activity and change!! Blessings to you, and to you a safe and abundant holiday season! TEHRAN, Iran (CNN) -- A devastating earthquake may have killed at least 20,000 people in southeastern Iran, government officials told state-run media, as emergency teams scrambled to deal with the crisis. Preliminary estimates so far put the death toll at about 2,000. The quake was centered near the ancient city of Bam about 610 miles (975 km) southeast of the capital, Tehran. Bam has a population of about 80,000 people. "The situation in Bam is worrying. The scale of the damage and deaths is widespread and the number of victims is high," Mohammad Ali Karimi, the governor general of Kerman province, told Iran's official Islamic Republic News Agency (IRNA). He said 60 percent of the city's residential areas have been destroyed. Tehran University's Geophysics Institute said the earthquake measured a magnitude of 6.3, according to IRNA. It was followed by several aftershocks, including one measuring 5.3. "The historic quarter of the city has been completely destroyed and caused great human loss," Nour Bakhsh with Iran's Red Crescent relief agency told IRNA. A legislator for Kerman province, Hasan Khoshrou, told The Associated Press people on the scene said the devastation was "beyond imagination." Adding to the crisis, both of the hospitals in Bam were destroyed in the earthquake, forcing people to seek medical attention in the provincial capital of Kerman. Private vehicles have been banned from the roads to make room for emergency traffic. "We have no exact information about the scale of the damage since all telephone communications with the cities of Bam, Jiroft and Kohnouj had been cut off," Karimi said. Mostafa Mohaghegh, another Red Crescent official, told CNN that rescuers were busy providing food, shelter and medicine to those injured in the quake. "The state of the damages is very wide in the city so we are yet to identify the total number of those who have died and also the injured." In explaining the severity of the damage to the city, journalist Shirzad Bozorgmehr in Tehran said Bam is an ancient city not designed to withstand a major earthquake. He said army search and rescue teams have been mobilized to the area. Meanwhile, Russia and Germany have offered to help Iran help in the rescue operations. Russian Emergency Situations Ministry spokeswoman Marina Ryklina said that two Il-76 transport aircraft with rescue workers and equipment were to leave for Iran later Friday, AP reported. Foreign Minister Joschka Fischer sent a telegram to his Iranian counterpart Kamal Kharrazi offering support. "Germany is ready to do everything in its powers to contribute to recovering and rescuing people in the earthquake region,'' Fischer wrote. German President Johannes Rau sent a letter of condolence to Iran's President Mohammad Khatami, and also offered German assistance, Reuters reported. "I assure you that Germany is ready to support your nation in overcoming the material damages,'' Rau wrote.